Regular foot care is important for preventing dry skin and calluses on the feet, as well as helping you get healthy, beautiful looking feet. Let Amopé™ help you take care of your feet by using the Amopé Pedi Perfect™ Electronic Foot File. It is one of the seasons must buys, and an easy and effortless way to remove hard skin from your feet without having to make an expensive trip to the salon. With its ergonomic shape and micro-abrasive rollers, in just a few easy steps your feet will be looking beautiful and smooth. Start by cleaning your feet, washing and thoroughly drying them before you begin. Turn on the electronic foot file, and begin to roll it across the skin on your feet. Allow the roller to move slowly over the areas of hard skin that you want to remove from your feet. Do not to push down too hard against the skin, and do not hold the foot file in the same place for longer than 3 or 4 seconds. When you have treated all the hard skin areas, and your feet start to feel smoother, switch off your foot file and rinse your feet to remove any excess dry skin. Treat yourself with a soothing foot soak for relaxing and cleansing. To complete the pedicure, apply Amopé Pedi Perfect™ Daily Moisturizer. 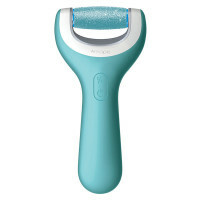 This is perfect to use after your home pedicure as it provides the feet with moisture for up to 24 hours. Whenever you find more time during the week, or when your feet require a top up – we recommend using the Amopé Pedi Perfect™ Daily Moisturizer. The cream soaks in within 60 seconds, it’s not greasy and it’s ideal for a daily application in the morning and at night and it keeps your feet smooth and soft for up to four days. To clean your foot file when you are finished, make sure it is first turned off and then push the button on the side to remove the roller head, this can be rinsed under a tap. To clean the rest of the device, wipe it over with a dry cloth and when both are clean and dry, you can reassemble them. Store your Electronic Foot File away somewhere safe with its protective cover on, ready to be used again next time!